"Supporting our members' needs is central to PLRB's mission," says Hugh Strawn, vice president of Catastrophe Services, PLRB. While PLRB was looking for both a partner and a base solution that could be configured and customized to its business process and practices, Esri Gold Tier Partner GeoDecisions (Camp Hill, Pennsylvania) was recommended due to its record of building applications based on ArcGIS for Server. GeoDecisions created a solution for PLRB called PLRB Map on the ArcGIS platform. From the beginning, PLRB Map was designed to be accessible via traditional desktop web browsers and mobile devices. This ensures that members get the information they need anywhere, whether in the office or in the field. It also simplified the needs for sharing and accessing information by requiring members to log in on approved devices that are connected to PLRB's secure servers. This solution houses data securely and internally at the association's headquarters while still providing member access to external data sources and important real-time information. It is easily customized and can expand to ensure future needs and scalability are fulfilled. Says Strawn, "PLRB needs constant performance and data access, independent of the number of members using the application, even during the biggest event or when teams of adjusters are deployed in the field." Analysis in North America wouldn't be complete without detailed information on tropical weather—which drives many incidents in the Gulf and East Coast—such as authoritative real-time and historic data from the National Hurricane Center, including areas that are under tropical storm watch or warning, hurricane track points, lines, and the "cone of uncertainty," as well as storm surge projections. "These can all be used to predict future extent and location, especially when used together with wind speeds and hurricane category overlaid with labels and the 72- and 120-hour forecast periods," says Strawn. 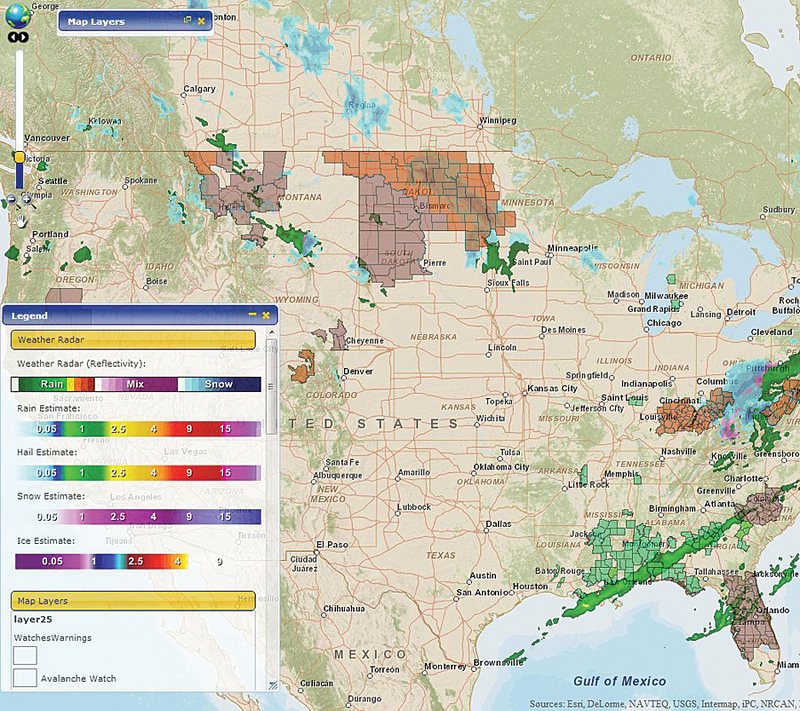 Perhaps the most significant benefit provided by PLRB Map is the ability for member organizations to leverage analysis of their own policyholder data and combine this with visualization of other member portfolios relative to catastrophe data or events. By providing secure, temporary access to commonly held data, PLRB members can visualize and analyze risk specific to each member's portfolio. Catastrophe managers are able to make strategic decisions about the risk and impact on their portfolio days in advance of upcoming events by using forecasts and other data services. "Typically, there is a 24- to 48-hour period between the event and ground-verified damage assessment," says Strawn. "Members can now quickly assess potential paths and impact against different portfolios and make plans to respond to potential and actual damage." "The ability to do this enables the claims departments to more easily assess the veracity of any claim," says Strawn. PLRB ensures the privacy and security of its members' policyholder records and has designed the application accordingly.